Addendum to Fees Policy. 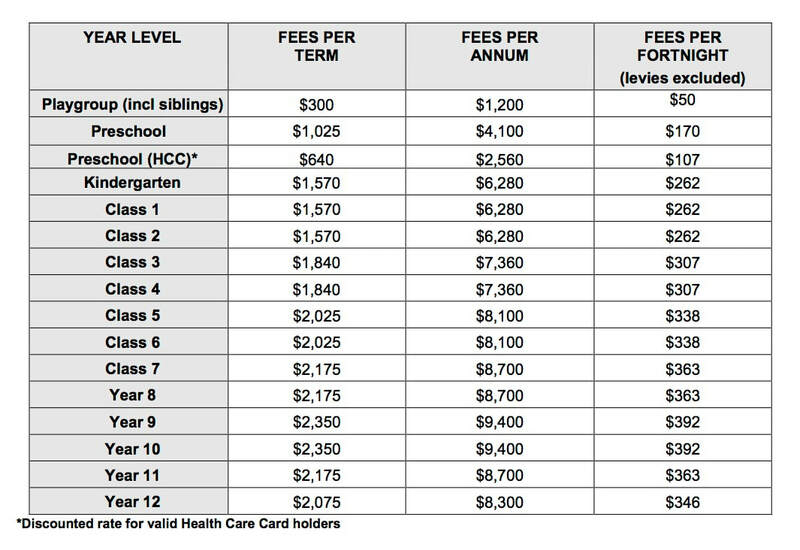 In 2019 all fees will be charged per term. 50% Discount per term for Aboriginal and Torres Strait Islander students (subject to eligibility requirements.) Family Sibling Discount does not apply to these recipients. Preschool and Primary School Tuition Fees include all camp costs and most stationery and materials. High School Tuition Fees include all camp costs, most materials, a text book levy and some stationery. A stationery list will be provided at enrolment, and at the beginning of the year, indicating some general items that are required for High School. There may be additional materials costs for some senior subjects that have a major work component. Some sports electives also attract a small fee. Additional costs, not included in the published Fees Schedule, may include bus fares, excursions, visiting speakers and performances, where agreed. Camps, Outdoor Education and excursions are an integral and compulsory part of Shearwater’s learning program from Years K to 12. All camp costs are included in Tuition Fees. However, some classes may attend specific cultural, academic or targeted excursions and, in most cases, these costs are not covered. Music is an integral and important part of Shearwater’s curriculum and is compulsory in Classes 3 to 6. Tuition Fees cover the cost of a recorder in Classes 1 and 3 and music instruction in Classes 1 and 2. From Class 3 to 6, weekly instruction, via shared lessons and ensembles, is included in the fees. Students are expected to purchase their own cello or violin for these lessons. Private lessons can be arranged independently with the music tutor. These are held outside daily class lessons and paid directly to the tutor. $500 First child in Years K to 12. $20 per child per annum or part thereof (incl GST). Details of cover and claim forms are available from the School. $350 per family towards the maintenance and upkeep of the School buildings, grounds, play and sporting facilities etc. Cost to be confirmed prior to acceptance. A 50 per cent subsidy (maximum $1,500) is provided. The cost difference of the TVET course is payable upon enrolling in the course. These specific cost details are to be determined with the Head of Faculty-Secondary School prior to course enrolment, as per the Senior School Handbook. Cost to be confirmed prior to acceptance. Fifty per cent of the course cost payable upon course enrolment and refundable upon completion of course, as per the Senior School Handbook.